Uganda Breweries Limited hosted Sorghum and cassava farmers from Northern Uganda at the brewery in Luzira. The aim of the visit was to engage and interact with the farmers who provide raw materials for Uganda Breweries production processes. 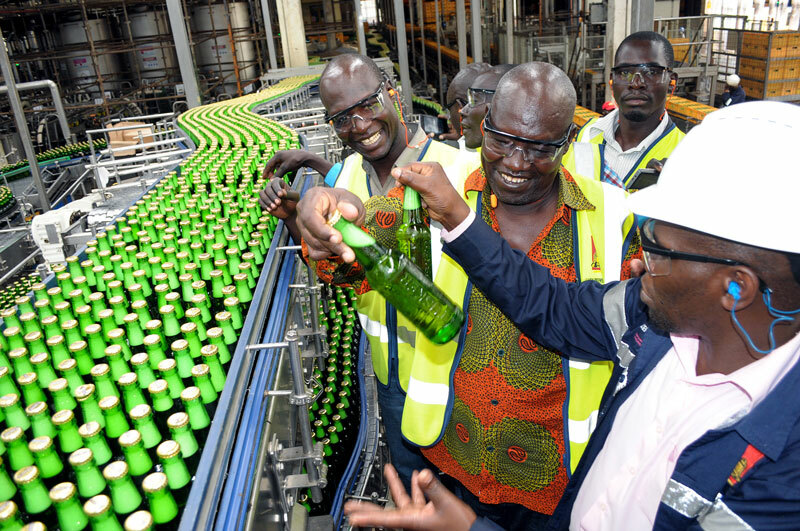 Uganda Breweries through its local raw material programme(LRM), injects Shs 20 billion annually into farming communities and value chains to obtain locally-grown raw materials for its brewing operations. The company has also invested over USD $10 million into the local grain sector promotion including large sorghum trials in Ngenge/Kapchorwa and Nwoya in the last seven years. Under the LRM programme, UBL supports hundreds of farmers with quality seeds and modern farming equipment, as well as gives them the necessary trainings throughout the seasons for improved productivity. UBL also provides ready market for farmers’ produce, which in turn is used to manufacture UBL beer. The farmers were taken on a guided tour around the beer production plant and taken through a step by step process of brewing beer. They were also given training on how to achieve the right quality products and taught how to identify good grain. The farmers commended Uganda Breweries for continuously sustaining their income.